Access to imaging technology is limited in low and middle-income countries, and further complicated by a lack of structured radiology training programs. These issues present a particular challenge to sustainable implementation of radiology services around the world. While many radiology training programs in the United States have partner programs overseas, there is often a lack of awareness about these important partnerships to attract the support they need. Below is a list of such programs related to IR with a short description and contact information. We hope you'll consider getting involved and helping us coordinate these important efforts. Two other complementary programs include SIR's Giveback Project at the IR faculty level and RAD-AID, an NGO well established in Radiology outreach with a large database of projects and volunteers around the world. In 2016 the RAD-AID chapter at Montefiore Medical Center, Albert Einstein College of Medicine, began to foster a relationship with the physicians at Korle Bu Teaching Hospital (KBTH) in Accra, Ghana. KBTH is the third largest hospital in Africa and is the largest tertiary referral medical institution in Ghana. The RAD-AID Montefiore team embarked on our first mission trip to Ghana in 2017, sending two residents and two CT technologists to join a larger team of physicians, MRI and CT technologists, information technologists, and biostatisticians from around the world. Our overarching goal was to lay the foundation for a long-lasting partnership between Montefiore Medical Center, Albert Einstein College of Medicine and KBTH in an effort to improve all aspects of radiological services at KBTH. This included providing educational conferences, maintaining quality and safe practices, and helping to improve workflow efficiency. Our team and department are currently working on a developing a cross-institution collaborative curriculum to supplement the radiology residency education at KBTH. The development of the interventional radiology department and residency is another crucial goal of our mission. KBTH provided the first IR services by a board-certified physician for a population of 26 million in Ghana. They are plagued with a scarcity of functional equipment and consumable materials. Additional challenges include a lack of support staff and a lack of physician and patient awareness. Despite these obstacles, IR continues to grow and continues to provide invaluable patient care. The IR department at KBTH and their struggles exemplifies interventional radiology in the developing world. We are striving to bridge this gap with a refined curriculum and seasoned clinical faculty. We are planning to send another team of physicians, technologists, nurses and information technologists in the fall of 2018. 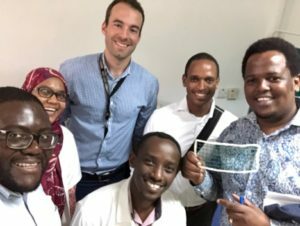 The program founders performed an IR readiness assessment of the Muhimbili hospital system in Dar es Salaam and found that there was not a single interventional radiologist in Tanzania, a nation of almost 60 million and projected population of over 100 million by 2040. Based on the findings of that assessment they developed a plan to address the urgent need for IR in Tanzania. They believe establishing an IR training program in Dar es Salaam in collaboration with RAD-AID and academic institutions from across the US will provide the most effective and sustainable solution with lasting impact on the Tanzanian healthcare system. The end-goal is a self- sustaining IR residency program, with Tanzanian IR faculty training Tanzanian residents. 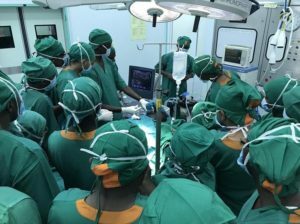 They are planning to send up to ten groups of interventional radiologists accompanied by IR technologists and IR nurses to Tanzania in two-week blocks spread out over the year for the next three to five years, starting in October 2018. Several University of Rochester Faculty have a long-standing research relationship with the University Teaching Hospital in Lusaka, Zambia. One of these faculty - Dr. Michael Potchen, a Neuroradiologist, has been working to establish a local Radiology training program within Zambia over the past several years, seeking cooperation from both the Governmental Ministry of Health and local Universities. This project was recently approved and now fully supports the training of six (currently) radiology trainees per year. Our team is working to finalize and implement a diagnostic radiology curriculum for these trainees. Two University of Rochester residents traveled to Zambia in January 2018 to kick off the program, providing 1 month of lectures and workstation teaching. 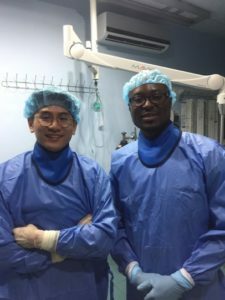 The education of the trainees now continues with continued workstation teaching by local Zambian radiologist as well as provided reading materials and online weekly case conferences with the University of Rochester. Most of the 6 inaugural trainees are interested in incorporating elements of IR into their practice. As this training program matures, we aim to include Interventional Radiology training, focusing on lighter procedures with high utility in Africa (biopsy, drainage, etc). This project has many other facets including codifying this curriculum/assessment strategy for deployment in other sub-Saharan African nations, harvesting of cases for the development of case banks/questions for practice and evaluation of trainees, and the completion of a RAD-AID country profile for Zambia.